As the end of this school year is approaching, many students are using this time to reflect and take pride in the many learning accomplishments they have achieved. Our Pine Glen students, as well all Burlington Public School Students have an electronic portfolio that they contribute to. Students' electronic portfolios are created in the Google App, Blogger. Here's a look at our students posting to their portfolios. WGBH invites you to join this free, fun-filled, family friendly day of hands-on science, technology, and robotics! WGBH is once again the media partner for this year'sTouchTomorrow, which transforms Worcester Polytechnic Institute's campus into a festival of exciting hands-on science and engineering activities. This free, open-to-the-public event takes place this Saturday, June 13, from 10 a.m. to 4 p.m. rain or shine. See the event website for more information, including directions and parking. Something for everyone at the festival! and get your picture taken with Quack from Peep and the Big Wide World. Think you can balance a cork on a toothpick? It's not as easy as it looks! Check out this Balance Magic activity on PBS LearningMedia™, then come to the festival to try it out! NOVA will be at TouchTomorrow to record students' creative answers about STEM careers. The booth will also feature NOVA's Emmy-nominated web series, "Secret Life of Scientists and Engineers," about amazing people who do cutting-edge science and engineering work and pursue interesting hobbies. After students share their thoughts on camera, head over to the NOVA Labs booth to do the work of a scientist! Tom Watson, author of the newly published book Stick Dog Dreams of Ice Cream will be at Barnes & Noble in Burlington, MA this Friday, June 5th at 7:00pm. He will be reading and will be available to personalize the book. We hope to see you! Barnes & Noble Burlington is located at 98 Middlesex Turnpike in Burlington MA across from the mall. Then students used the app, Drawing Pad on their classroom ipads, to illustrate one of the sense sentences they had written. 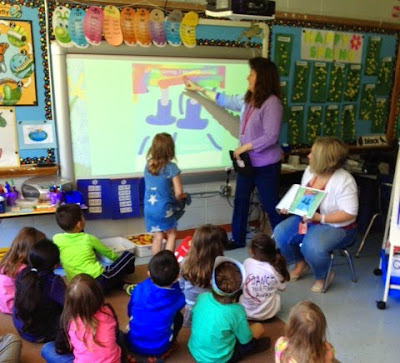 After illustrating, Miss Carney and Mrs. Ardizzoni helped type the sentence on their drawings and students then concluded by typing their name. 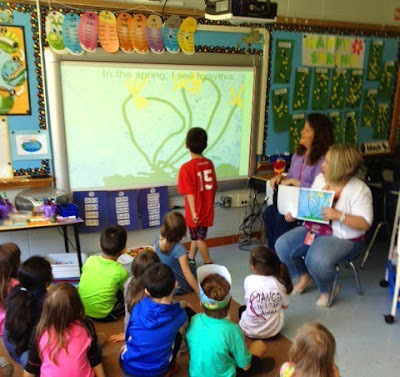 Next, Mrs. Ardizzoni used the app, Book Creator to compile all of the students' illustrations and writing into one classroom poetry book. Here we are, back in the classroom where students got to see their final product as both an ebook and hardcopy classroom version. Students were called up to the board when their page was displayed and they read their sentence aloud. Congratulations kindergartners! Please scroll down through the pages of Our Spring Senses Poetry Book. There are two ebooks to enjoy.